Colder temperatures are coming, and Albuquerque drivers are bracing themselves for bad weather. Rock salt, ice scrapers, and antifreeze are all important. But have you ever thought of getting winter wiper blades? These special blades can help you out a lot when bad weather strikes. Winter wiper blades can help protect you from dangerous conditions such as snow, ice, freezing rain, and hail. These conditions make it harder to drive because they reduce visibility. So if you live in an area that is frequently impacted by bad weather in the winter, you should consider replacing your wiper blades with winter-resistant ones. 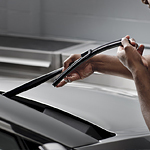 Special winter wiper blades can be encased in a special material that prevents snow and ice build-up. They can also make it easier to remove frost from your windshield. If you are thinking about replacing your wiper blades with winter ones, don't do it by yourself. Come down to your local dealership to have your wipers replaced for the winter.